The iPhone 5s comes in a retail box that's exactly the same as the iPhone 5's from last year in terms of size and shape. Our Space Grey unit came in a white box, whereas last year's Black model came in a matching-color packaging. The box contents haven't changed either - you get the Apple lightning USB cable, an A/C adapter, EarPods headset with volume controls and microphone in their separate box and the SIM tray eject tool. There are a bunch of leaflets and, for the first time since the iPhone 4, Apple has thrown in two stickers. The iPhone 5s has kept the exact same dimensions and weight as the iPhone 5. At 123.8 x 58.6 x 7.6mm and 112 g, it's probably the most compact premium smartphones in the market. Just not sure this is the compliment it appears to be, considering what kind of screen size and resolution qualifies as premium these days. Four inches of screen diagonal is what the iPhone 5 also has, the build and finish being the same too. Obviously there was room for the new processor, bigger battery and camera sensor, along with the new fingerprint scanner, in the old iPhone body. The design of the iPhone 5s, like with every S version in the iPhone lineup, hasn't changed dramatically. And we'll say it again - it doesn't need to. The most prominent change are the color options - the White Silver option is the only one that looks identical to the iPhone 5 - the Black of old is now Space Grey, which is a much lighter hue, which contrasts nicely with the dark strips top and bottom. And, there's the brand new Gold option. The True Tone flash, which is essentially a dual LED flash, and the home button doubling as a fingerprint scanner are the only other differences over last year's flagship. Apple prides itself on the immaculate build of its flagship iPhone and this year's model is simply the next installment in the premium category. Every detail has been carefully considered and crafted so as to deliver the impressive 112g of weight. The front is entirely covered in Corning Gorilla Glass, with cutouts for the earpiece and home button only. The sapphire crystal and stainless steel-framed Touch ID button looks very subtle on the iPhone 5s face, contributing to an almost uniform glass surface. Two black strips of glass frame the aluminum plate around back. The aluminum is matte and feels grippy enough. It proudly features the iconic logo and the iPhone inscription, in contrasting mirror-glass surface. What the iPhone 5s is missing, compared to the iPhone 5 is a black paint job. Handling the iPhone 5s is a pleasure, which is hardly any news. It's built to the highest standards and has a premium feel that few can even hope of matching. The screen size is the only thing that out of line with current trend. 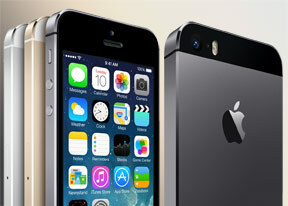 There a numbered few smartphones in the market that come close to the iPhone 5s in terms of build quality and finish. The HTC One comes to mind with its curvaceous, yet uncompromisingly cool aluminum back. Sony's Xperia Z1 has the steel frame to compliment the front and rear glass panels but it feels huge compared to Apple's latest gadget.